John M. everette, 63, 0f 4 Lord Court, Palmer Township, died Monday April 29 (2002), in easton Hospital. He was owner and operator of Diversified Sound Systems in Palmer Township since 1973. Before that, he worked at Public Service Electric and Gas of New Jersey for many years. Born July 22, 1938, in Bangor, he was a son of Marion O. Miller Everett of Easton and the late Maurice R. Everett. He was a member of St. Andrew's Lutheran Church in Palmer Township, where he sang in the choir and was a former member of council and had served on the Property and Pasroral Search committee. 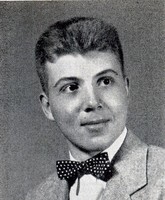 He was a 1956 graduate of Easton High School. he earned an electrical engineering degree at Lehigh University in 1961. He was a member of the Choral Union of Lehigh University and was active with the Kappa Alpha Fraternity. He was a member of the Warren County Community Singers. He and his wife, the former, judith Seifert, observed their 39th wedding anniversary in June. In addition to his wife, he is survived by three daughters, Susan E. walther of Elkins Park, Pa., Kristen McCabe of Buckystown, md., and Jennifer L. of New york City; a sister, Karen Kowak of Bath; and three grandchildren. Memoral services will be held at 2 p.m. Sunday in the church, 3900 Freemansburg Ave., Easton. Three will be no calling hours. The Ashton funeral Home, 14th and northampton Streets, Easton, is in charge of arraingements.